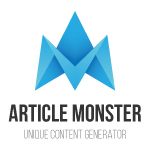 The Article Monster is the ultimate unique content generator. Great for SEO and video marketing. Create real high-quality articles in 60 seconds, without paying monthly fees for article spinner nor expensive copywriters. This product is created and sold by Lukasz Kubow, the product's vendor.